Its the opposite it encourages you to push up rather than expecting to sit back and take people down with lucky pot shots. But why though? You gain very little by attacking them, unless you're seriously under-looted. Hence 3 kill wins actually occurring, that'd be very rare in pubg. The way we play is we push push push until 4 or so teams left, then we play carefully. But a lot of the game is third partying or recovering/finishing quickly to take on the next team rushing you during the first ten or 15 minutes. Get eyes on the whole team before you push if possible, BR 101 really but you need to be a lot more careful than Fortnite. Last edited by fuzzy2308; 12th February 2019 at 11:19 am. Warming to a Hemlock/Peacekeeper combo....also that Wraith ulty is so good when your team on coms, full flank another team, shots to back of head *swoon*. 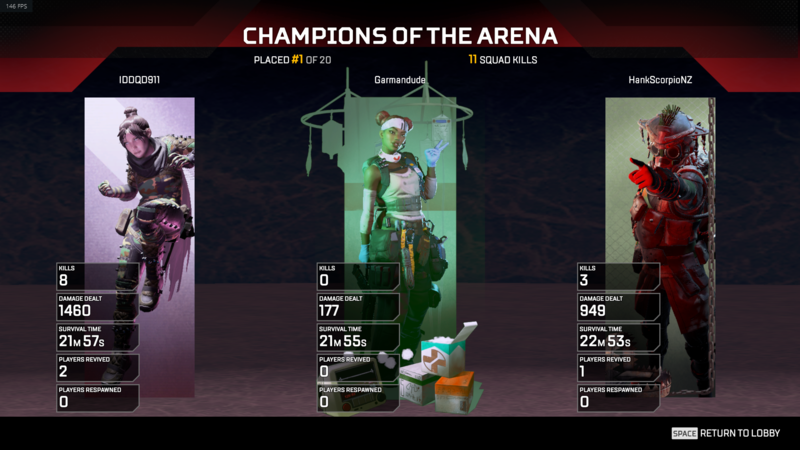 Nothing like doing 1200-1400 damage in a game with no kills. Having won a couple of rounds now, I've found the best strategy is to have skilled team mates who can carry you. My mate who i play without alot likes to gung-ho into battles where I like to evaluate a bit before I push. Also just constant push to place to place rather than holding a good position (especially late game) Idon't see us getting much success being opposite play styles lol. Yes certianlly win more with people who are fast rather than dithering around and wont push. One of the things we like to do in premades is hot drop enemy teams at the start punch them all to death in succession. Compared to PUBG; this game really does award pushing/flanking opponents. It rewards players who are proactive, rather than reactive; I think that's why I like it much better, but is also why the game feels much less tense. This is why I'm hesitant to play. Not because the game style doesn't suit. It's fun, but at this stage where I'm useless and still learning then I feel like I have no time to pick things up because I'm shoe horned into a squad of 3. If it was hard to get them yeah that's a cool reward I guess. I don't think any BR has a reward for winning ? Gotta admit Overwatch was the first ranked game I ever played and after that Ive struggled to get into any game without some kind of good rank progression to grind out. The exception being with BR games since winning itself is still rewarding. No that's true, I'm just saying at this stage for me there isn't much point in it. It's in it's infancy, but it's just not holding me as much as it did.